It is extremely difficult to watch a loved one decline as dementia ravages his or her mind, robbing him or her of memory, thinking abilities, and judgment. 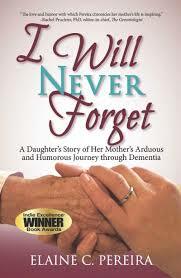 In her touching memoir, I Will Never Forget, Elaine C. Pereira shares the sometimes heartbreaking and occasionally humorous story of her mother’s journey through dementia, as seen through the eyes of her little girl. Pereira begins by oﬀering entertaining glimpses into her own childhood and feisty teenage years. Through it all, Pereira shares how her mom’s unconditional love and creative parenting style helped mold an opinionated young woman into a resourceful adult who eventually would move mountains on her mother’s behalf. As Betty Ward slowly begins to wander down the dark and narrow corridors of Alzheimer’s, Pereira details her mother’s amazing ability to mask the truth until something as innocuous as a drapery rod suddenly launches a waterfall of events. As their roles shift and a new paradigm forms, Pereira transforms into a caregiver who blindly navigates dementia’s unpredictable haze while her mother orchestrates Houdini-like disappearances and surprisingly rallies to take charge of her own destiny. I Will Never Forget shares a powerful, emotional story that can help people aﬀected by dementia take comfort in knowing that they are not alone. My mother’s is a story that needed to be told. She was a kind, brilliant and talented woman all of my life until Dementia took hold distorting her persona and leaving an agitated, bewildered and compromised person in its wake. In the shadows of WWII, during an era when very few women attended college, my trailblazing mother earned her Bachelor’s Degree in chemistry and later on acquired a Master’s in Education. Many years later, though, after experiencing a decade of unspeakable tragedies, Mom began to exhibit uncharacteristic and disconcerting changes in her personality. Episodes of irrational behaviors, paranoia, flashes of hostility and illogical thinking, replaced her formally patient, bright, organized and articulate essence. In what would be her final months, as my mother continued her rapid descent into Dementia’s clutches, her once strong voice faded away. Our quiet visits together afforded me the opportunity to reflect on the vivacious life that defined her. I was determined that she would not be remembered as a withering mumbling older woman but as the strong, courageous and gifted lady who was my mom. I am humbled and honored to have been able to give back to the woman who gave so much and blessed to have many great friends and family who supported me in my endeavor to write I Will Never Forget. I envisioned dementia as a smoldering fire, its smoke whirling up and down, in and out, around and through Mom’s brain. It would choke her orientation to time, cloud her vision or pretzel-twist her gray matter. It always lay in wait, concealed in the crevices of her short-term memory centers, fogging judgment, reasoning, and logic. For a while, it would remain dormant, having already ravaged parts of her mind permanently until, like wildfires, something sparked it to flare up, engulfing and consuming its insatiable appetite for brain cells. Elaine Pereira retired in June 2010 as a school Occupational Therapist where she worked with special needs children. She lives in southeastern Michigan with her husband, Joe. Between them, they have five children — Joe has three sons and Elaine has twin daughters-and soon-to-be five grandchildren. 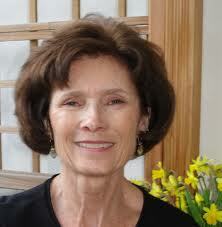 Elaine has a Bachelor’s Degree and Master’s Degree in Occupational Therapy from Wayne State University. Elaine is the author of I Will Never Forget and she was inspired to tell her mother’s incredible story in part to help other caregivers coping with memory loss issues in their loved ones. Having watched, from a distance, friends and family who have suffered from the what Alzheimer’s does not just to their loved ones but to the entire family, I was keen to get an insider’s view. Elaine’s story is told in a warm and personal way, allowing the readers to see Betty Ward, her mother, for what she was before the illness struck and later as her mind was taken over by Alzheimer’s. This makes the story even more poignant. Although each patient and situation is different, Elaine’s lucid style of writing and her honesty about her mother’s journey and her own role as a caregiver, makes this book a great read for those who have loved ones suffering from Alzheimer’s and anyone who wants to know more and spread awareness about dementia and dementia related diseases. I well remember my mom’s descent. I battled with it, finding the ways to slow it down, fighting to keep her in the “now” – we managed to do that fairly well for the four years after my dad passed – until she had joined him. It is something I wouldn’t wish on anyone – watching a vital, alive, amazing person founder and not even realize they were losing themselves. It is interesting how this subject is also becoming more prevalent in fiction as well. Just today with the announcement of the Baileys Women’s Prize for Fiction is the book Elizabeth is Missing by Emma Healey. What makes her book sound really interesting, is that it is told through the eyes of Maud, who is the one suffering from dementia. Eric at Lonesome Reader wrote a beautiful review of it and I am looking forward to reading it. Thank you for this review Corinne, it is great that the author was able to share her experience with others to help them, we certainly can never have enough books like this. Thanks for the writeup, Corinne. I’m not very familiar with dementia and don’t know anyone in my extended family that suffered from it. Lots of other sicknesses but not dementia. I did see Azheimer’s portrayed intimately in the Iron Lady where Margaret Thatcher suffered from it towards the end of her life. Sounds like an excellent book that give us a real first-person account of what it’s like to take care of someone with dementia. Some of the excerpts show the author’s ability to perfectly capture and help us understand what it’s like to suffer from dementia. This disease robbed my father of his mind and it happened slowly over a period of years, until it was just gone. A sad, sad thing. But research is promising! It sounds like a book that will definitely touch my heart. My mother is battling depression and it requires a lot of courage and understanding from the caregivers especially with the lack of awareness and stigma attached to mental disorders. Dementia is one of those things that does scare me. It’s so random and so rapid in many cases. Thank you for sharing this review. I have added this book to my reading list. Lovely! I have the book – and found it fabulously well written. I found the author’s tone wonderful! Dementia – so many facets to deal with, the first one being acceptance. It is painful to see families dealing with it – and when they’re unintentionally unsuccessful – it is so sad.